Accounting for Real Estate Transactions is an up-to-date, comprehensive reference guide, specifically written to help you understand and apply the accounting rules relating to real estate transactions. This book provides you with a powerful tool to evaluate the accounting consequences of specific deals, enabling you to structure transactions with the accounting consequences in mind, and to account for them in accordance with US GAAP. Maria K. Davis is a partner in the Accounting Consultation Group at Deloitte & Touche LLP's National Office in Wilton, Connecticut. In her current position, she provides accounting guidance on technical accounting issues, primarily in the subject matters of Real Estate and Leases and Joint Ventures and Consolidation, both under U.S. GAAP and IFRS. Before joining Deloitte's National Office, she worked directly with Leon Mayshak, who was then Deloitte's Real Estate Industry Professional Practice Director, In that role, Ms. Davis participated actively in the standard-setting process by contributing to the AICPA Statement of Position 04-2, Accounting for Time-Sharing transactions, and the proposed Statement of Position, Accounting for Certain Costs and Activities related to Property, Plant, and Equipment. A native German, Ms. Davis has published on U.S. accounting standards in the pre-eminent German accounting journal Der Betrieb. She also contributes to Deloitte's interpretation of accounting standards in Deloitte's Technical Library. Over the course of her career with Deloitte, Ms. Davis has provided attest and advisory services to Deloitte's clients in a variety of industries in both the United States and Germany. Ms. Davis received a Master's Degree in Accounting from the University of North Florida, as well as a Degree in Finance from the Hochschule München, Germany. In addition to her CPA qualification, she also holds professional qualifications as a German certified public accountant and a German certified tax advisor. Ms. Davis is a member of several professional organizations, including the American Institute of Certified Public Accountants, the Florida Institute of CPAs, and the German Institute of certified Public Accountants. Part I. 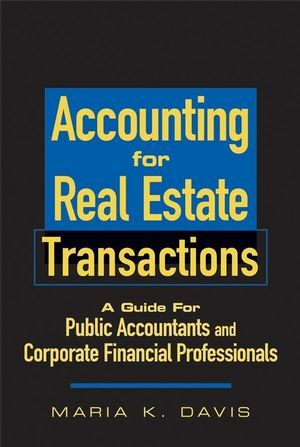 Accounting for Real Estate Transactions — General. Chapter One. Acquisition, Development and Construction of Real Estate. Chapter Two. Non-Monetary Exchanges of Real Estate. Chapter Three. Real Estate Sales. Chapter Four. Real Estate Leases. Chapter Five. Sale-Leaseback of Real Estate. Part II. Accounting for Real Estate Industry-Specific Transactions. Chapter Six. Interests in Real Estate Ventures. Chapter Eight. Retail Land Sales.